While traveling to Thailand earlier this year, we decided to take a quick stop in Singapore for the weekend. Singapore is one of the smallest countries in the world, and is comprised of only one city. Although it is only 26 miles wide, it is a global business hub with glorious architecture and fantastic food! Here are the top things to do in Singapore. Hainanese Chicken Rice – One of the national dishes of Singapore! This dish is cooked by boiling the chicken, which helps to keep the meat super moist. Then, the rice is prepared with some of the chicken fat, garlic and ginger. The meal is a simple plate of chicken and rice, but the care the cooks put in the preparation really makes this dish shine. Kaya Toast – This is the most common breakfast in Singapore. It is a simple dish of kaya jam on toast. What is kaya jam, you ask? It is made of eggs, sugar, and coconut milk. While eating a jam with a photo of eggs on the label seems somewhat off-putting, kaya is seriously delicious. So tasty in fact, that we bought three jars to take home. Think of it as a tropical custard. You can find kaya toast all over Singapore. Laksa - This was the last meal we had in Singapore and it was our favorite! (Why didn’t we discover this on day one?!?!) It is a cross between a curry and a soup. Our bowl was made with noodles, shrimp and coconut milk. It was a bit spicy and packed with flavor! Singapore Sling – This sweet and tropical cocktail is enjoyed worldwide, but originated in Singapore back in 1915, even before Singapore was established as a country! Get the original at the Long Bar at the Raffles Hotel. Carrot Cake – No, this isn’t the dessert that you are thinking of. Carrot cake in Singapore is a savory dish, and it doesn’t even use carrots! Made with radishes (which the Chinese call white carrots), egg, and rice flour. This dish is almost reminiscent of a hashbrown omelet, but way better! Eat everything at a hawker center – We love to do as the locals do! When in Singapore it is customary (and super delicious and clean) to eat at the local street food stalls. There’s at least one hawker center within 15 minutes walking distance wherever you are in the country, and they’re a true melting pot of Asia. Hawker centers are similar to a really big food court, with many casual stands and a general dining area. You will also find many shops selling clothing, shoes, and home goods. Take a tour of Chinatown – Singapore has a large Chinese population, and the city’s Chinatown is probably the cleanest, nicest, and most beautiful Chinatown we’ve seen in the world. Enjoy shopping at vendors and stop by the Buddha Tooth Relic Temple. Admission is free to the temple. Keep in mind that the dress code states that you are not allowed in the temple with shoulders or legs exposed, and shawls are available to use to cover up prior to entering. AirBNB – There are a number of nice condos in skyrise apartments available to rent for around $140 US a night. We stayed at a modern, luxury condo in the Central District. Our pad had a great view of Singapore, saunas, rooftop pools, and even an in-pool treadmill and spin bike! (So COOL!) We recommend that you target something in the central district or Chinatown to be close to most attractions. Even if you want to save more money by staying in another neighborhood, the entire city is easy accessible by the MRT public train transportation system. If you have never used Airbnb, use this link to get a discount on your first booking. Planning a trip to Asia? 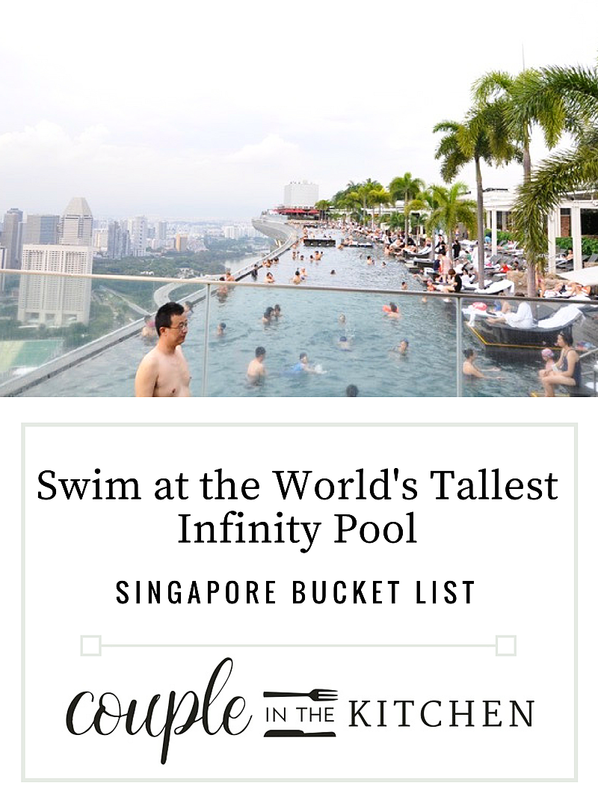 Be sure to check out our foodie guides on Thailand and Pin this travel guide to Singapore!